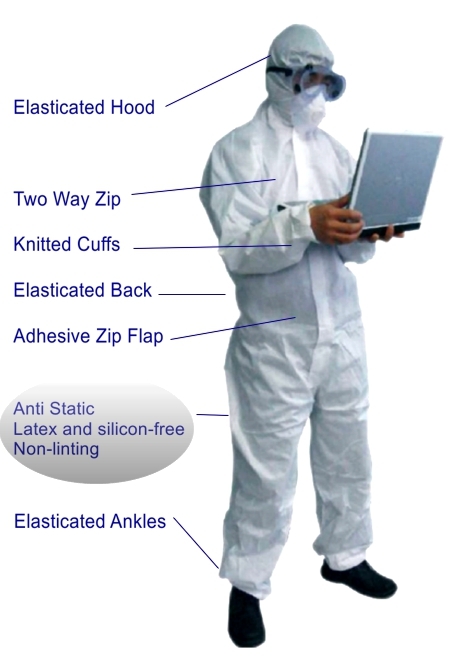 Chemsplash™ Pro Coveralls are made from 63 grammes/square metre, microporous, laminated polyolefin fabric. It makes them Strong, Light, Water-proof and BREATHABLE, for all day comfort. Chemsplash™ Pro fabric is non linting and anti-static (EN 1149-5 2008**) and thus useful for protection in clean- work, where environments may not be contaminated with garment fibres, dust or skin particles. Bulk pack: #25 per size. Dust and small particulate matter. Vicky, a final-year Forensic Science student at the University of Glamorgan uses Glamorgan's unique Crime Scene House facility to introduces us to forensic imaging, the process of documenting a scene of crime. You can find out more about our BSc (Hons) Forensic Science degree at http://courses.glam.ac.uk/courses/73-bsc-hons-forensic-science. Click the button below to add the CHEMSPLASH PRO Coverall to your wish list.